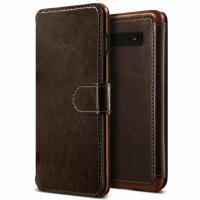 The VRS Design Dandy Wallet Case in dark brown for the Samsung Galaxy S10 Plus comes complete with card slots, a large document pocket and is made with a luxurious leather-style material for a classic, prestige and professional look. 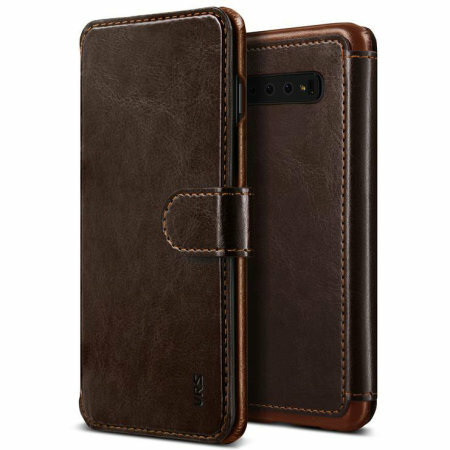 The Samsung Galaxy S10 Plus Dandy Wallet Case is made from luxurious leather-style material for a polished and professional finish. 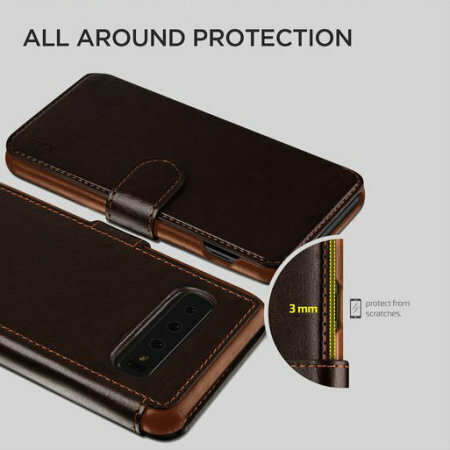 It not only looks great, but has a superb tactility that transcends as you open the case and feel the stitched leather-style lining that effortlessly protects the screen on your Samsung Galaxy S10 Plus. Embossed stamping lends authenticity and prestige, leaving no doubts as to the case's pedigree. The Dandy Wallet Case from VRS Design utilises a form fitting frame to protect the entire phone from external impacts that could leave your Samsung Galaxy S10 Plus in need of repairs. This frame is distinguished with a complimentary colour to the outer casing and adds a pleasing touch to an already sophisticated overall design. 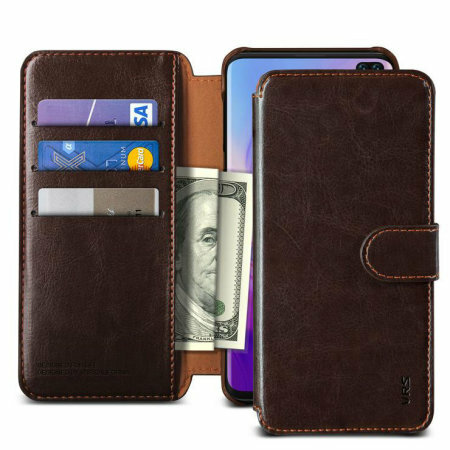 With 3 card storage slots and a generous document pouch, the Dandy Wallet Case has taken functionality into consideration, enabling you to take your Samsung Galaxy S10 Plus, money and cards with you in one protective case. 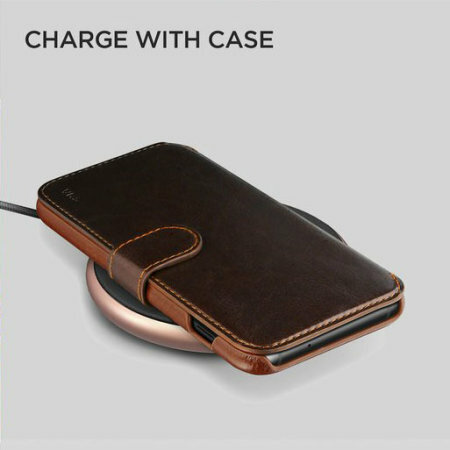 So you can leave the regular wallet or purse at home and travel extra-light - this case has it all covered! To avoid any frustration when receiving and making calls speaker holes have been included in the front cover so conversation will remain crisp and clear. Cut-outs have also been included for all the additional features of the Samsung Galaxy S10 Plus including the camera and ports. 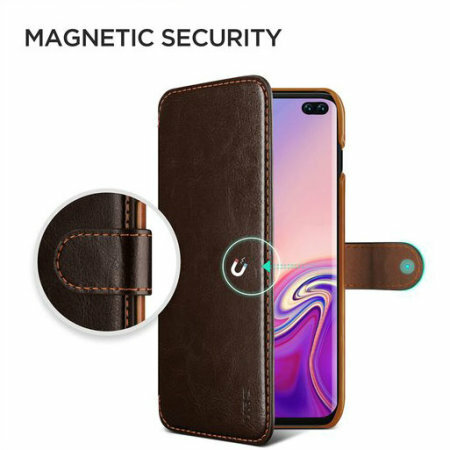 Designed specifically for the Samsung Galaxy S10 Plus, this case from VRS Design offers a perfect fit for your device.